Frankly, I think that sanity is waaaaaaay overrated. I mean, you've got all the stuff that's going on in the outside world. There's no melting walls. There's no flowers growing out of lightbulbs. There's no flying just because you feel like it. There's no cacophony of voices in your head. I think it'd be better to just go mad. 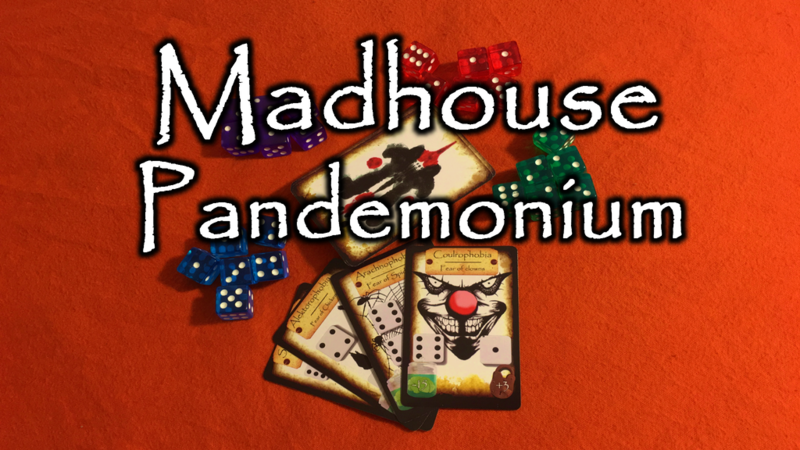 Thankfully, Madhouse Pandemonium can help, as turning yourself into a madman is just what the game's all about. In the game, each card represents a real mental disorder. You're looking to maximize your score by playing certain cards in front of you, indicating a disorder that you have no, while playing others in front of other players, afflicting them with some sort of disorder that'll have them helping you out. Though going insane isn't easy. You have to work at it. That means you have to roll your dice and match the dice on the cards you want to play. When there's only one player left, you compare scores and the one with the highest is the winner. The Kickstarter campaign is under way now. They've got 37 days left to go.